Just in time for St. Paddy's Day! 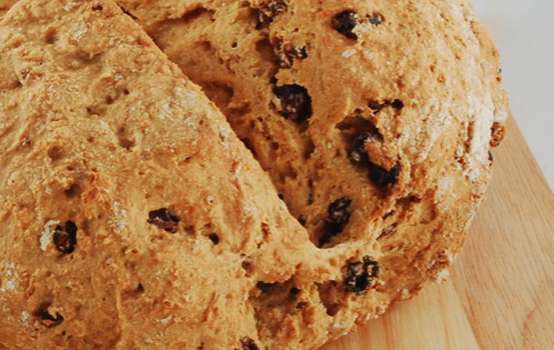 Traditional Irish soda bread is made with just four ingredients: flour, buttermilk, salt and baking soda. Since buttermilk is easily made vegan by combining 1 tsp lemon juice or apple cider vinegar to every 1 cup of non-dairy milk, I thought this would be an easy recipe to veganize and I was right! A whole wheat vegan version of the Irish comfort food! Perfect for spreading jam or dipping into coffee or tea. Lemon juice may be substituted for the apple cider vinegar. You can also increase the sugar to 4 tbsp for a sweeter bread. Combine the apple cider vinegar with non-dairy milk and set aside for at least 5 minutes. Grab a really big mixing bowl (the biggest you have) and add the flour, sugar, baking soda, salt and raisins. Whisk until it's evenly combined and well incorporated. Whisk the non-dairy milk mixture a few times until it's light yellow and curdled. Slowly pour non-dairy milk mixture into the flour, stirring as you go with a wooden spoon until it's wet and dough-like. You may not use all of the liquid. Knead the dough once or twice to shape it into a ball but be careful not to over knead or it will be tough. Place dough on a greased cookie sheet or a greased cast-iron skillet (how the Irish do it). Using a serrated knife to make an "X". Bake 30 to 45 minutes @ 425F, until it's golden and cooked thoroughly. Check by pushing a long, wooden skewer or thin chopstick into the center. If it comes out clean, it's done. Also add an aluminum foil tent over top after 20-25 minutes if the top is burning or getting too dark.